The best way to make more work for yourself is to implement the wrong Onboarding solution. This is a guide to help you find the right one. Before you invest in onboarding technology, review the best-in-class features below to ensure you get the most bang for your buck. First days can be overwhelming for everyone. 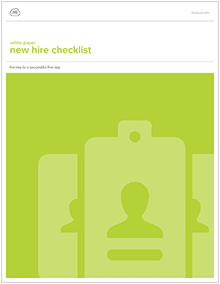 Here’s a new hire checklist to help you prepare so when new hires arrive for onboarding, you’re ready. Whether you’re building your onboarding process from scratch or looking to improve, this itemized checklist is a great place to start. Onboarding from Scratch is the first of three papers that will help you reduce cost of hire, decrease turnover, and increase employee retention through onboarding. 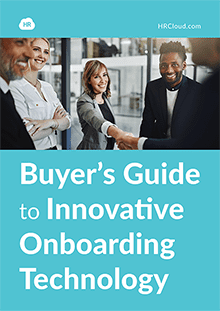 Onboarding, if done right, leads to early productivity, excitement, and increased engagement of new hires. 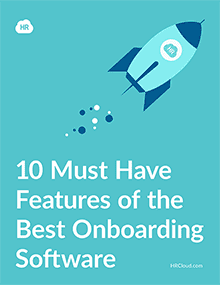 Not only that, onboarding makes new employees comfortable in their work environment and cognizant of collegial relationships and assignments and how they matter to overall company objectives. Launching a Successful Onboarding Initiative is the second of three onboarding papers from HR Cloud. This paper focuses on the specific activities that should be included in an organization’s onboarding program. The paper also discusses the importance of HR technology in support of the onboarding process and how onboarding can be directly tied to organizational performance. How to measure onboarding return on investment (ROI). In 10 Ways The Cloud Improves HR Processes, the final paper in a series focused on onboarding, you will learn how cloud technology benefits not only onboarding processes, but also HR processes as a whole. The cloud is here and that is a good thing for HR professionals. The difficulty is that it forces HR to wade into a new technology—and that takes time. This white paper helps HR quickly get on track by exploring 10 reasons that are driving the decision to move HR processes onto the cloud.